The Churches of Peace in Jawor and Swidnica are the largest timber-framed religious buildings in Europe and a symbol of religious tolerance from the 17th century. After the Peace of Westphalia (1648), the Protestants in Silesia were allowed by the Habsburg Roman Catholic emperor to build three churches. Restrictions were that they had to be constructed outside the city walls, made of wood or clay and built in less than a year. The architect responsible for all three was Albrecht von Sabisch. The churches had to be big enough to be a true place of refuge for the Protestant population. He designed wooden buildings that had never been seen before in complexity and size. The church in Glogów burned in 1758, the other two in Jawor and Swidnica were restored by Polish-German cooperation. Jawor is a town just off the main road between Berlin and Wroclaw. The location of the Church of Peace is indeed inconspicuous - I drive past it on my first approach, am led to some vegetable gardens by my SatNav and decide to try it again by myself. When I see a tour bus and a cemetery I feel that at least something has got to be there. When I stop my car I notice even a large sign including the Unesco symbol, facing the other way than I came from. The church itself, although of a large size, is hidden behind trees. When I arrive, members of a music group are unloading their instruments from a van and carrying them inside. I just sneak in between them, fortunate for the chance to see the church interior. The walls and ceiling are totally covered with white and blue ornaments. The scenery reminds me of some of the wooden churches that I visited last year in Slovakia, although those churches are much smaller. The floor of the church in Jawor is completely filled with rows and rows of wooden benches: it has room for 6000 people. And this church is a Protestant one (not Orthodox or Catholic as in Slovakia), however more exuberant than usual to be able to compete with the Catholic baroque splendour of its neighbours. There are no less than 143 biblical scenes painted on the walls, and an ornate high altar. A wonderfully preserved and original site, and still in use. I had wanted to visit Swidnica too - but I didn't plan very well and just couldn't find the town! Back in my hotel I looked it up in Google Maps and noticed that it is located about 20 km southeast of Jawor. According to the ICOMOS evaluation the two remaining churches are quite similar, so I don't feel too bad about it. I had visited the Church of Peace in Jawor before, so this time I visited the other one in Swidnica. The photos speak for the difference between the two interiors. From Wroclaw (where I currently live) I went there by mini bus, but would recommend going there by train. Mini Bus is cheaper but is not so comfortable, and it's not so easy to find where in Wroclaw the mini bus leaves for Swidnica. It is hard to say which of these churches is more beautiful, both are extraordinary buildings, and despite many similarities they show distinctive differences, most notably in the interior decoration. The similarities resulted from the constraints in their construction: both churches are impressively large timber-framed structures, the exterior is rather plain with hardly any decorative elements, only little is reminiscent of a church. Therefore, the interiors are even more surprising: abundant decorations all over, adorned galleries and colourful paintings. This combination of opulent Baroque design with Protestant faith is unexpected, but it obviously should compensate for the rather austere exterior and certainly they tried to compete with the Catholic environment. First we visited the church in Jawor, the town is an hour's drive from Wroclaw. The church is located in a small park and hidden behind tall trees. After entering through the rather unimposing wooden door, we had a real wow-effect. We stood in a rectangular hall with four galleries on both side walls, the balustrades are decorated with picture panels depicting biblical scenes and guild signs. The interior is dominated by white and blue colours, quite unusual for a church. In particular I liked the coffered ceiling decorated with blue ornaments. Swidnica is about 35 kilometres south east of Jawor. The churchyard is enchanting, located behind high walls and with tall trees, hundreds of gravestone and iron crosses have been preserved. The Baroque interior is very similar to a Catholic church, more than it is in Jawor. This is mainly due to the decoration in red and gold, but also because the floor plan has the form of a Greek cross. The photo shows the view to the huge organ that dominates the rear part. Although we had noticed the large size from the outside, we were surprised by the spacious interior, there is room for 7000 worshippers, 3000 of them on seats. A recommendation for those who travel by car and use a navigation system: the coordinates on the UNESCO website are imprecise, you will end up a few hundred metres away from the churches. The German and Polish Wiki entries provide the exact coordinates. The Churches of Peace are impressive monuments. The historical context of their origin after a cruel and destructive period in European history tells a fascinating story. Reason enough to confirm an outstanding value. The churches were very much neglected during the communist regime. Today, they are beautifully restored by the joint efforts of Germans and Poles. So the churches are also a symbol of reconciliation between the two countries over the last two decades. These churches actually were an interesting change for this serial church visitor, the wooden construction suited the ornate but still charming painting. I also found it easy to discern the story and importance of these structures, relating back to a story of tolerance for Protestant minorities. My initial plan was just to visit Jawor and that is where I headed first. Luckily I had read Els' note about it not being instantly obvious and checked on street view first how to get there, it still didn't stop me from doing an extra lap of the town's one way system. The church sits in a nice park and is rather hidden despite its large bright white bulk. Stepping inside was certainly a "wow" moment, the amount of painted wooden surfaces contrasted with the golden chandeliers. The attendant asked me which language I would like the tour in and queued up the English one next on the sound system, in the interim I practiced my German by trying to understand the audio tour put on for the only other visitors. This wait allowed me to stroll around the creaky nether regions of the church trying to identify the painted biblical scenes. As the English tour reached its conclusion a large Polish tour group arrived, filling the church and giving an idea of how the church may feel during a service. The attendant then turned on all the chandeliers and the already impressive interior seemed to swell to greater proportions. The rebuilding of a bridge meant my route back to Wroclaw took me with in 10km of Swidnica, so it seemed rude not to call in. Like Jawor the church here is in a nice park and you can't see much of it from the road. You can certainly see the two churches were built in the same circumstances. Swidnica felt somewhat darker with the reds and golds lingering in my colour memory. The large scale painted scenes were spectacular and the finest to my eye. 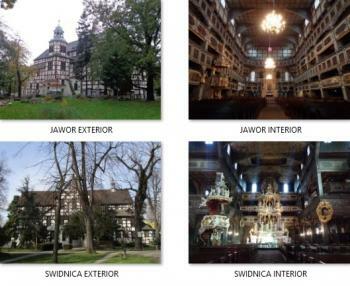 However I think Jawor was the church that suited my taste more. These churches were rather impressive and do a good job of illustrating an interesting story in European history, a very worthy diversion if you are in the area. There are plenty of wooden churches all across Central and Eastern Europe, and most seem to be inscribed on the WH List as well. Still, these 2 are definitely worth seeing, and their architecture is really impressive. I first went to Jawor, then to Swidnica - both towns are not too far away from Wroclaw, and a visit to both makes a nice day trip, which is also reasonably easy to do by public transport (although a bit time-consuming). Both churches are quite impressive, although the one in Swidnica is bigger and definitely gets more visitors (Swidnica is also a much bigger town than Jawor). It is really hard to believe that both are Protestant churches, as they are quite lavishly decorated. When Silesia was still part of the Habsburg domains in the 17th century, the local Protestants were granted permission to build these churches as a gesture of goodwill after the carnage of the Thirty Years' War and the following Peace of Westphalia. There were some rather petty conditions attached, though, such as the prohibition to use any other building material but wood, or the requirement that the churches be built outside the city walls. Still, the locals built them within a year (another condition), with the financial help of Protestants from across Northern Europe. Quite a remarkable achievement, really, and true to their name, they function even today as symbols of reconciliation between Poland and Germany. Last October I reached both churches in one day from Wroclaw. I travelled by train to Jawor, changing at Legnica. Later I caught a bus from the Tesco car park in Jawor to get to Swidnica, then returned from Swidnica by bus direct to Wroclaw. Both churches were open for visits, and at Jawor I received a recorded commentary in English. But at Swidnica there were only brochures in Dutch. But the profusion in both churches of religious artwork and gilded decoration was stunning. I recently visited the town of Swidnica where one of the two surviving Churches of Peace still stands. The town is about an hour away from Wroclaw and easily accessible by a minibus from Wroclaw railway station. Swidnica is a very nice Renaissance town with a small and well preserved historic core. It also seems to be a lively town despite its small scale. The Church of Peace is situated 10 minutes walk from the main square, where it once stood outside the city walls. The church is huge, wooden and densely ornamented - a special and quite impressive combination. It also features a complex row of galleries, each of which is covered by frescoes. Unfortunately, I couldn't have a complete impression of the church during my visit as I couldn't go up to the galleries. I hope this is possible in general and that this was only due to current renovations, because it seems the view from the galleries is much wider and gives a better grasp of the building. Moreover, even on the ground floor I was limited to only one half of the church, so I couldn't really see enough different angles of what seems to be an elaborate building. Nonetheless, this is an exceptional church and does merit a visit. I do wonder though whether Swidnica is indeed the better choice of the two inscribed (the other one is in Jawor) if you can't make it to both. Roman (Czechia) did a very nice description of these churches. We used our own car to reach these sites and we found it very easy, even despite it is very dangerous to drive in Poland. The paintings on the walls are very nice. For those visiting Krakow it is not "far" since there is a motorway (there are a few in Poland but this picture will change in a few years due to the entrance of Poland in the European Union) connecting Krakow and Wroclaw (another UNESCO site). I was an American Peace Corps volunteer teaching English in a high school in Swidnica, Poland, from 1997-99. I visited the Peace Church many times and, with permission from the pastor, I made a new cassette recording in English about the church that is available to visitors; one can also listen to a recording in German or Polish. 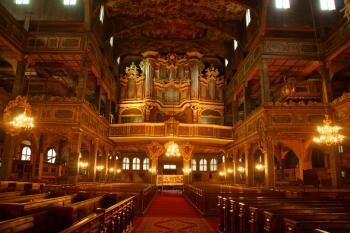 The church is an architectural gem and one of the most beautiful in Poland. My last visit there was in September,2005. Churches of Peace are great artistic achievement with Catholic-like innner decorations,even though Protestants'. 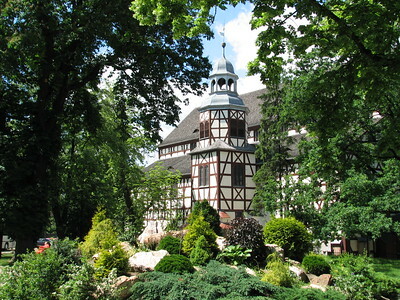 The magnificient atmosphere is covering these wooden architecture and are welcome for the visitors kindly. When I went there,both churches were closed but,caretakers of each churches unlocked it for me and I could see inside. I recommend this world heritage site strongly,if someone is about to travel in Poland. It wasn’t easy to get to Swidnica but with some assistance from a few Polish bus companies I eventually found the small town at the foot of the Sudeten Mountains. My guidebook told me that in medieval times, Swidnica was one of the wealthiest towns in Silesia and a commercial centre well known for its beer, sold as far away as Prague. To me it looked like a small copy of neighbouring Wroclaw but with a certain charm of its own. 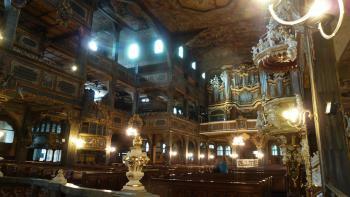 I have visited the Church of Peace in Swidnica. There is another one in Jawor and the third one was built in Glogow, but it burned in 18th century. The churches were built after the Peace of Westphalia, when the Lutheran Protestants were allowed by German emperor to built their churches. The building conditions were very restrictive as they must have been built during one year only, at the back of the city walls and only timber, clay and sraw as unstable materials could have been used. They were supported by very rich protestant famillies and they made something, what considering the condition is really breathtaking. 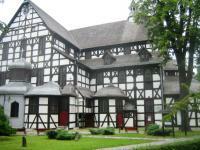 The church in Swidnica is in a peacefull park and the timber-framed walls of the church look interesting. The inside is absolutelly excellent. 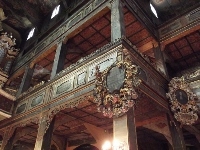 There is a great baroque interior completely carved in wood. There are two galleries, so the church seats about 7,000 people. The wood is painted in gold and the frames of the galleries look like laces. Really exceptional place. Thirty Years' War: "The Churches of Peace are outstanding testimony to an exceptional act of tolerance on the part of the Catholic Habsburg Emperor towards Protestant communities in Silesia in the period following the Thirty Years? War in Europe." Built in the 17th century: Jawor in 1654-55, Swidnica in 1656-57.